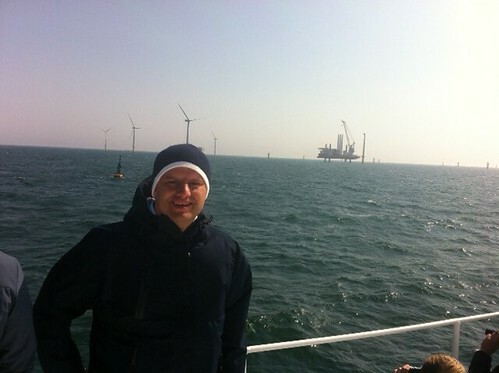 On Friday [7 June], I was able to participate in a trip around the German North Sea, to visit all the offshore wind farms currently under construction or in operation. This was organised by wab - windenergie agentur Bremen - which has been organising in June one of the nicest conferences of the year. Plenty of pictures below the fold. The island is actually relevant to the industry, as several projects (including the two we visited next, see below) are installing their operations bases there - so there is quite a bit of construction going on on the island right now, with new facilities (quays, storage facilities, etc.) being built and quite a few people working there. 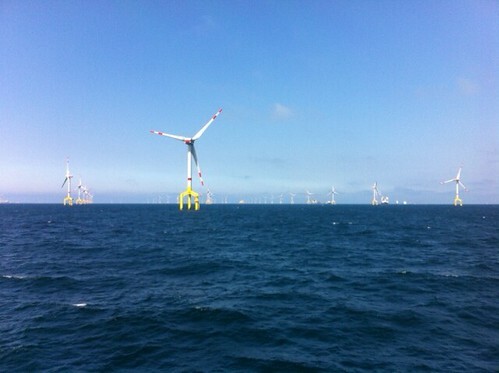 All three nearby projects, Meerwind (Blackstone), NordSeeOst (RWE) and Amsrumbank (E.On) will have bases there and the three have actually decided to cooperate to have common installations to a good extent. This makes sense as these projects are much closer to this island than to any other land-based port and this will make for much shorter trips to the wind farms. 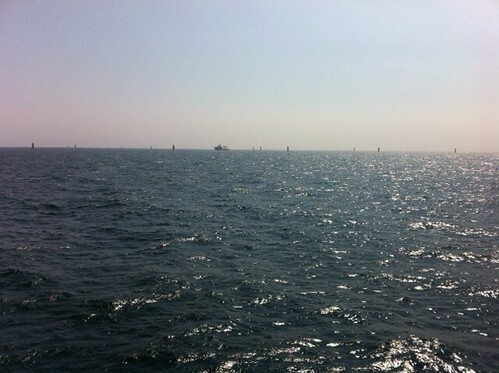 And indeed, we arrived shortly to Meerwind, the Blackstone project which I worked on in 2011. It's a 288 MW project which will use Siemens 3.6 MW turbines. Not a lot to see, as so far only foundations and transition pieces have been installed, but work is on track. This project uses "monopiles" (i.e. a large steel tube hammered into the subsoil) as foundations, and these just edge out of the water. A "transition piece" is then fixed on top of this (that's the yellow bit): it includes the access facilities - landing for boats, stairs to get up to the top, platform and the flange to connect the tower of the wind turbine. Most of the foundations and transition pieces have been installed on the project and turbine installation should start a bit later this year. Just next to it is the NordSeeOst project, which uses a different type of foundation, the "jacket", which is a sort of lattice structure, fixed to the subsoil via four much smaller steel tubes. This is a structure commonly used in the oil industry and it is expected to be used for the deeper projects or those using heavier turbines. 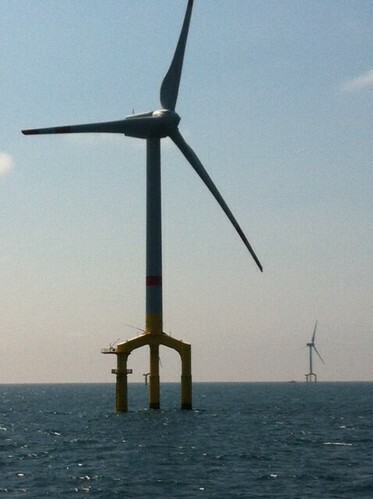 In this case, it will use the Repower 6M turbine, probably the heaviest in the market today. With 48 turbines, this will be a 295 MW project (the turbines are rated at 6.15 MW). The picture is not great, but we did not come very close as work was under way on parts of the site and security rules are quite strict on navigation. Colleagues may have higher resolution pictures from "real" cameras and I'll post these if I get them. After another bit of navigation in calm waters (ideal for work at sea, and indeed we saw a lot of activity throughout the day), we reached Globaltech 1, another project financed in 2011 (I worked on it when I was in my previous job, but not when the financing was signed). It is also at the foundation stage of construction. It will comprise 80 Areva 5000 (5 MW) turbines (400 MW total). GT1 is run by SWM, the Munich municipal utility, in consortium with several other utilities and investors. In Germany, each project has its own sub-station but then connects to larger offshore substations owned by the grid operator, which is responsible by law for the connection back to land. Delays were announced in the schedule for construction of these major offshore substations, and this has in turn delayed some projects. But a new law voted this winter has clarified responsibilities and should allow for a more organised overall construction schedule for the whole industry. 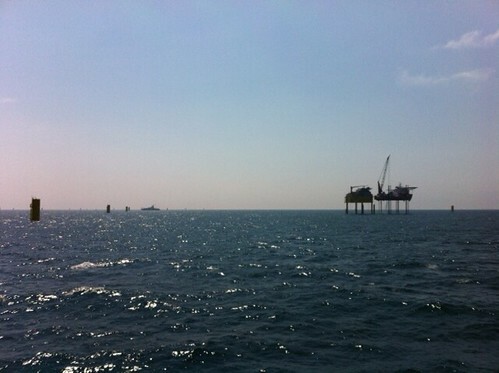 Next to GT1 is the largest offshore producer in Germany for now, the infamous BARD 1 project. 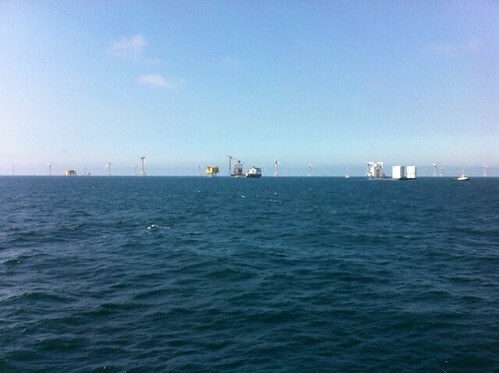 BARD was a developer of offshore projects which decided to manufacture its own turbines and do everything in-house. It managed to obtain a financing for the project from the German/Italian bank Unicredit, but has not been able to sustain its business and the bank is now in charge of completing the project. The project has suffered through a couple of years of delays, but is now well-advanced, with its 80 foundations in place, 65 turbines installed and 47 officially connected to the grid (on the picture below you can see both the project's substation and the main substation owned by the grid operator). A lot of construction activity was going on at the site, with at least 5 major construction vessels involved, and hopefully the project can be completed this year. Unfortunately, the turbine (a 5 MW model) has been discontinued and the very specific tri-pile foundation designed is also unlikely to be replicated (you can see pictures of the foundations while they were manufactured in one of my earlier posts). Excellent production data has come out of the site, which also hosts the FINO1 met mast whose wind measurements have been used as a reference to calculate the wind potential of all the sites in the wider area (you can see the metmast slightly on the left of the picture). 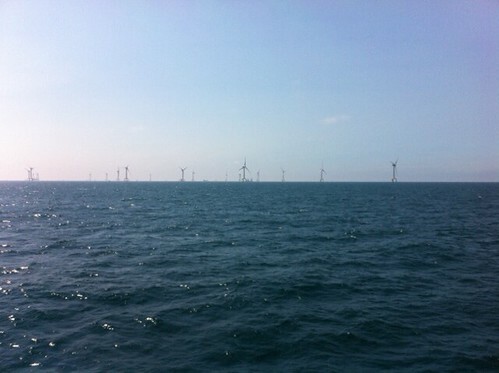 The final site to be visited is the Riffgat project, nearer to shore (and picture at the top of this diary), a smaller 30-turbine project using Siemens 3.6 MW turbines developed by EWE, one of the northern regional utilities. As you can see, it has already begun to erect the turbines and work has been progressing well. I don't know how much this is visible, but the turbine under work has one blade installed and they were preparing to install a second one. It was a long day at sea, but in perfect weather it was an amazing experience to be able to see all the developments under way in the sector in the country. And within a few months, the industry will suddenly change from being a nice idea to becoming a tangible reality, with more than 1 GW of capacity installed and a lot of people directly involved. to be accompanied by Crazy Horse during this trip. That map at the start of the diary is fascinating. 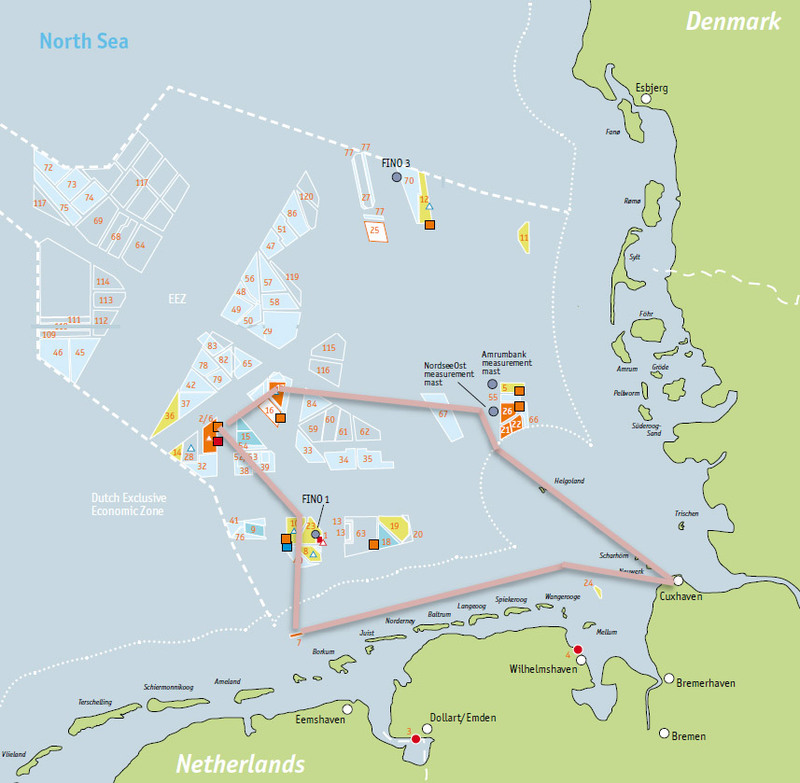 As you perhaps may well know, in The Hague the Powers That Be are busy hashing out a national energy plan for 2020 - and it's no secret that offshore wind is in the picture. If the meetings don't end in gridlock, the plans should be finalized by July. I'll try to keep track, let me know if it interests you. ...to be accompanied by the Chief Green Giraffe. One amazing part of this, since there was extra room on the Hollunder Jet catamaran, was the ability of some of the offshore guys who work 12 hours x 6.5 days a week, to show their kids just why they're so busy. I noticed one of the chief substation designers staking out a top spot with his kid right over the twin waterfall exhausts, where the wind was strongest, and he and family stayed there the entire 10 hours... well armored against wind and spray. We we also privileged to witness the performance of the newest crew supply boats, and wow. Also, we were visited by the Nordic, the German gov's 24/7 emergency tug, which can pull a distressed container ship back to shore in storm conditions. Someone should also post some converter and sub-station photos (better than this). Someone needs to go out with a long lens - perhaps on a steady-cam. A small clarification, if I may, about Bard: you wrote: "The project has suffered through a couple of years of delays, but is not well advanced" - should that "not" be "now"? is not well advanced" - should that "not" be "now"? I assumed so, and took the liberty to correct it (along with other typos, and AFAIK EWE is much bigger than a Stadtwerk). indeed, thanks for the correction. You also had 54 turbines for NordSeeOst, which didn't match the total capacity and all sources I could find, so I corrected to 48. 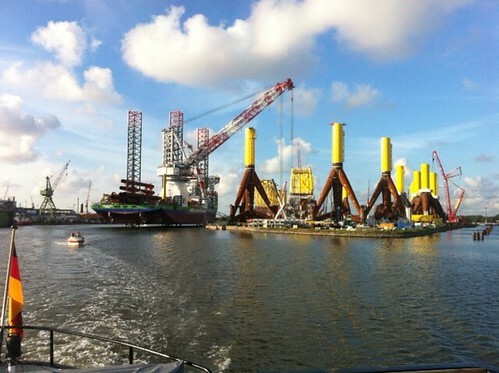 Yes, EWE also owns Stadtwerk Bremen (SWB), and is the primary owner of Alpha Ventus. It wouldn't be all that hard to construct a computer database and some payment mechanism to companies providing the information from companies accessing the data. An idea. No idea if it is workable. According to the German Wikipedia, 267 and 268 GWh in 2011 and 2012 (against a predicted 220 GWh a year). Both of these correspond to an astronomical capacity factor of 50.8%. But we haven't seen its performance in a bad wind year yet. And within a few months, the industry will suddenly change from being a nice idea to becoming a tangible reality, with more than 1 GW of capacity installed and a lot of people directly involved. If I calculated right, the in-construction + in operation capacity add up to a bit over 1.75 GW. Nice. About when will all of that be on-line? About when will all of that be on-line? ...and how much capacity is there in total on the German continental shelf, if it were all built out? The sum total is 54.1 GW. We'll have 2 GW within a year or two, probably, yes. It depends both on the individual schedules of projects and on the schedule of completion of the corresponding grid connections. DoDo, from Alpha Ventus we're not looking at the difference in inter-annual variation, but performance against real wind. Alpha Ventus has great performance, better than expected. What's more important is the cost of that high performance. 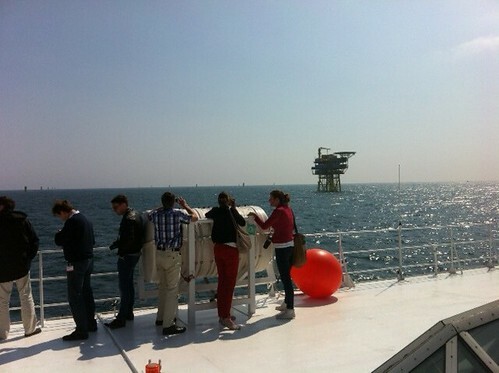 Alpha Ventus was built as a test field for the offshore generation of turbines, and that's its value. The Wartungskosten (O&M costs) are indeed high to create such performance, but again, Alpha Ventus is a test field. Each manufacturer has only six turbines, so optimizing costs is not even in question. But as a test bed for high capacity commercial installations, it is a completely successful operation. 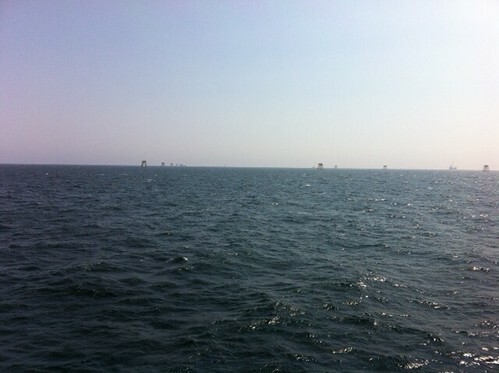 Remember, this is the first of the deep water, far afield offshore projects. As for when German first round projects will be online, the delays to date rest primarily on the shoulders of the grid operator, TenneT, and its converter station suppliers. To make lemonade out of lemons, this delay has given manufacturers and logistics suppliers (vessels) more time to optimize procedure. The German government is actually responsible for the unlikelihood it will meet its 2020 installation target. Also remember that unlike every other EU country, Germany opted to avoid all near shore controversy, by beginning in deep water at great distance. There is an interesting trend in a special kind of attack on renewables: the selective attack on a well-developed renewable mode of generation paired with the praise on an undeveloped one. As some of you remember, back in 2003 when on-shore wind installations peaked, the usual suspects said "Nooo, on-shore wind is noisy and landscape-spoiling and has a low capacity factor, solar is the real future deserving of support!" The result was a revision of the feed-in law (with the support of the right-wing parties) accelerating on-shore wind's degression (and reducing areas where it is supported) while boosting rooftop solar from 2004. When solar boomed and became cheaper way beyond expectations, the usual suspect began to cry, "Nooooo, solar gets too high rates and is a bubble, the real future is utility-scale off-shore wind!" The result was accelerated annual degression bound to a target band of annual new installations, (bubble-causing) one-off rate cuts, and finally (sensibly) monthly degression in the revisions effective from 2009 to 2012. Der Spiegel reports today that the federal environment ministry will release a report tomorrow showing that Germany has a huge potential for onshore wind, and the director will table an idea that offshore wind be taken out of the EEG (feed-in law) and financed separately. While he says that off-shore is losing importance due to increased on-shore potential, he thinks off-shore should be developed further for reasons of industrial policy and job security. He proposes financing though tax-based tenders as an alternative to inclusion under the feed-in law. For costs reasons, he advises a reduction of development goals [post-Fukushima the Merkel government set a target of 10nbsp;GW by 2030 and 25 GW by 2030]. IMHO the second point is stupid: while it bypasses the feed-in law industry 'exemptions', this proposal is in effect a certificate system, which is not effective whether the goal is boosting domestic supply or just developing an export technology. But at least he used conditional wording. Spiegel mentions an earlier study by the same agency for a 100% renewable supply which foresaw only 60 GW wind (twice today's). That's why Spiegel doesn't think that the limitations of the study affect the point that on-shore potential is enough. 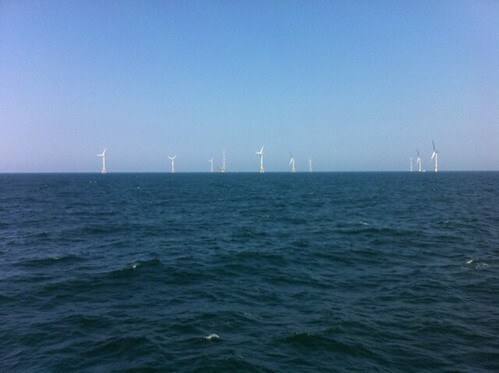 Regarding the new boom of on-shore, the industry association said they expect 2.9 GW by year-end, which would make 2013 the second best year after 2002 (and together with off-shore, the best year for wind overall). WAB has commissioned a study by VDMA which should be out in a month or so, addressing the industrial policy needs of keeping shipyards alive as well as the supply chain. An interesting point is why Germany decided at the time to invest so strongly in off-shore. Surely part of that was the belief that on-shore wasn't big enough; but Merkel is a political animal, and I suspect it was done as an "insurance" against politically motivated NIMBY blackmail against land wind power. We have seen very little of that in Germany (contrary, e.g., to Australia). To also correct myself, the off-shore wind targets go back ten years to the SPD-Greens government, Merkel & co only accepted it seriously post-Fukushima. The belief that on-shore doesn't have the potential is more ten years ago. As for Merkel's post-Fukushima support for off-shore, by thinking of NIMBY, you are assuming a political animal truly thinking in decades. I think the thought that Big Energy will like off-shore wind more than solar or on-shore is closer to it. Where NIMBY blackmail is being used is against strengthening of the grid. This thing is part over-blown. There are a lot of projects well pre-dating the renewables boom which are now tacked on the need for balancing intermittency. At the demand side, DIW also criticised the method of estimating needed grid capacity, saying that it is too focused on large thermal plants and doesn't consider their throttling. And the truth is that beyond NIMBYism, the post-liberalisation reduction of investment and regulatory difficulties held up grid expansion, too. The good news is that grid investment now reached pre-deregulation levels and a law to enable accelerated approval just passed. Only if this means much more wind power in south Germany. Until now, this has been held up (intentionally) by zoning laws. Baden-Württenberg's Greens-led government is changing that for that state, though. Thanks DoDo. That's interesting to read. Actually I am not sure their calculation works. They have 49,400 square km of suitable area, and want to build 1190 GW of capacity on that. That's by my calculations 24 MW / km^2. Which would produce some 8 MW on average per km^2. I have seen one study using general circulation modelling, showing that you cannot efficiently extract more than 1 MW for every km^2. So there's a discrepancy of 8x. Now of course if the suitable areas don't form big blocks but disconnected patches and strips, it won't be that bad. What's truly stupid about the questioning of feed-in support for off-shore is why we are having the debate now. As things stand, the 10 GW target for 2020 will probably be missed by a large margin due to the start-up difficulties, thus it's too early to speculate on a significant price effect (of any kind) due to the high off-shore wind feed-in rates. We should have this debate in 2018 or so (when the degression of those feed-in rates for new installations is currently set to kick in), when we can see whether serious cost reduction potentials became visible. The Q3 solar FIT degression and price index numbers are coming up in July. If a suitable news to tag it to presents itself then, I'll put the updated graphs into a diary. Indeed 24 MW would be eight 3 MW turbines, which as low-wind turbines with 100-m-plus diameters would need separating distances of nearly a kilometre in the prevailing wind direction – at most half of that would seem more realistic. Based on the 2,900 TWh-a-year figure, they seem to have considered an average capacity factor of 27.8% (probably realistic if we consider low-wind turbines with high towers), thus an average power of 6.7 MW. Still way above that 1 MW or even the 2-4 MW of local models. I'll look for the report and check their assumptions. Disconnected patches and strips is indeed the 'solution', check the example diagram on page 31 (you can even have a single tightly-spaced wind farm with the turbines placed on several separated but nearby suitable areas of less than a kilometre across). This also reduces the applicability of the 1 MW/km² figure for large contiguous windfarms. They used two reference wind turbines (one weak-wind one strong-wind), and an iterated placement with a minimum spacing of 456 m (four times the [larger] rotor diameter of the weak-wind turbine). With a triangular grid pattern on a large uninterrupted suitable area, I calculate 17.77 and 18.88 MW/km² as maximum density on actual land area (as opposed to the area of the patches of suitable land) for the 3.2 MW resp. 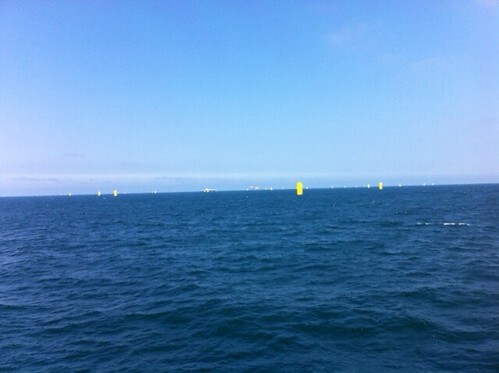 3.4 MW reference turbines. I found that Jacobson has also studied this problem, arriving at considerably higher average power densities: ~ 4 MW/km^2. My current rule of thumb is that you can pack at least 10 MW per sq. km. You need 7-8 rotor diameters in the prevailing wind direction, but can get away with 5 in the other direction. Grid operators and utilities may have technical and economical reasons to attack currently the most popular renevable because of impact of electricity production and market. If adding wind has increased intermittencies in such amount that utilities don't like it they may prefer solar installations to limit high cost imports or reserve plant use. When solar power has depressed day peak prices so much that it starts to hurt baseload plants utilities may prefer some other kind of renevable energy production. Now you make me wish I had taken photos from a my plane window. On the return leg of a recent trip to India, we overflew the area and I had an incredible birds-eye view of the entire off shore area. 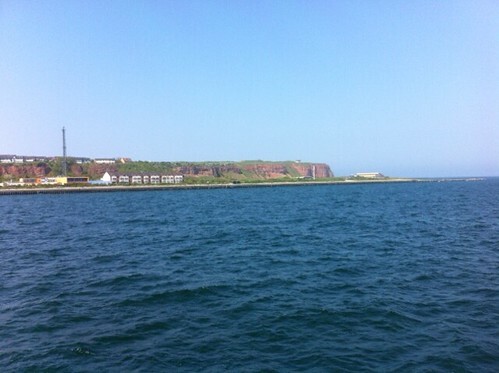 It was a clear sunny day (in fact too sunny, as the stewardesses had us close the window shades to keep the sun out - that is why I was unable to photograph the offshore wind farm). Depending on prevailing winds you can have excellent view of the Dutch wind farms when landing in Amsterdam as they are quite close by. ET scoop. NSA facial recognition was inconclusive. When does the Arte interview come out? Linky? They said it would be for their Tuesday investigative show in the evening, and it should be aired in September ("jut before the election") - 4 or 18 September IIRC. A fairy whispered this into my ear: a journal article, with this as background. I have been trying to read and understand this, but is it really true what I suspect: their modelling is based throughout on the currently existing German grid, i.e., no grid strengthening is considered. Obviously their results are no surprise then. Can it really be that simple? Serious question. they assumed the same hourly generation profiles in their projections of increased production as in the chosen three days from 2010 data. As for not considering grid strengthening: indeed; and there are also possible changes in grid operation, and that includes much simpler things than smart grids and electric cars: like the idea of setting of reserve capacity every day instead of every three months. 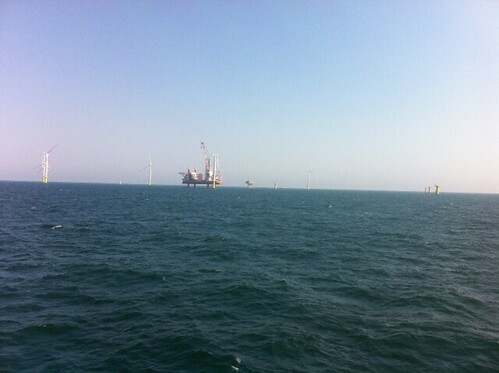 To bring this discussion closer to the topic of the diary, the planned Norway-Germany undersea cable is significant in connection with the grid compatibility of the North Sea wind power. The Federal Grid Agency is about to release its 2012 annual report. News reports say that the Agency now thinks that the critical situation it saw a year ago has eased. One positive change credited with this was the opening of a new grid connection at the end of last year (as linked above for the "indeed" part). Another is that at the shut-down Brokdorf A nuclear reactor unit, the steam generator was turned into a phase shifter. the project for a base-load hard-coal block 6 was abandoned. Well in the greater scheme of things I don't see that as a negative... and don't see why the Federal Grid Agency would want a new baseload plant for grid stability. Doesn't it say that right there in the abstract? If you shut off all the nukes tomorrow, what happens the next day? That is a slightly different scenario from the "OMG Houston we have a giant problem here let's spend a couple of trillion Euros to fix it over the next ten years and part of that is shutting off the nukes" scenario. No, they made calculations for the system in 2012 as-is and with the already shut-down nuclear plants added back in, and with and without nuclear phaseout in 2017 and 2022. From their results, supposedly the 2012 situation is the most critical. Somehow that didn't happen; I suspect both falling demand and the rise of solar power (vs. their 2010 basis data) changed the equation significantly. Another hit piece by the Economist. But because so much renewable power has come on stream, and because it has priority access to the grid, the spot price of electricity has fallen to a level at which modern, clean natural-gas power plants are not viable. Only ageing, dirty brown-coal power stations with low variable costs can compete. But... surely the price differential between gas and lignite fuel is not affected by how much renewable electricity is released on the grid? Or by what fraction of the time these fossil power plants will run? What they probably mean with this muddle, is that the investment in new gas backup plants is not attractive under these conditions. So, pre-existing lignite plants are used. Somebody should write a comment piece on this. Jerome? The effect they observe is that gas, as the highest cost (both levelized and marginal) producer is being displaced from baseload and scheduled load following use by wind, whereas lignite is not (yet). This is because natural gas has a cost structure that never actually belonged in the baseload portfolio. It's presence in the baseload portfolio of Britain is partly a symptom of the gross inefficiency of deregulating the electricity market, and partly an atavistic legacy of Thatcher's crusade against the British coal miners and the contemporary development of the North Sea. Or to put it a bit differently: Europe in general and Britain in particular has been heavily under-investing in baseload for a generation and a half. This has allowed gas to creep into the baseload portfolio, where it has no business being under any sane grid planning regime. Now new baseload is coming online, in the form of wind and solar, and this is in some measure making up for the underprovision of baseload. This, of course, displaces gas, because gas is a generating mode that has no business being run as baseload in the first place. That this leaves in place those legacy modes that are optimized for baseload production, such as lignite, is not a bug. It's a feature. If you don't like that feature, make a political decision to close the lignite-burners - they will be easily replaced with gas in the short term and renewables as they come online. All that may be true, but that's not what they write! They write that the relative share of gas is dropping, and the relative share of coal is rising, due to the entry of renewables into the grid. That's the sum total of their "analysis," such as it is. There is no causal model, because economists don't do causal models. There is no robustness check against alternative scenarios, because economists don't do causal models and you need a causal model to construct credible alternative scenarios. There is no internal consistency check on the story, because the Economist does not do due diligence when a naive reading supports the conclusion it wants. The overwhelming majority of your average issue of The Economist is written by highly educated incompetents for highly educated incompetents. gas plants are higher in the merit order and thus taken out by renewables more often than coal. As renewables keep on growing, coal will be hit too. One could argue that Gerany should have closed coal plants before the nukes (I share that opinion), but most of the rest of what they say is silly. Now that wasn't even worthy of a commentary. It's down there with 'global warming stopped last Friday'. Where's the world coming to when not even economists grasp a concept like 'the longer term'? So Keynes was anti wind power - I always suspected it. Only in the long run. ...and solar (primarily solar). But it could be the lignite, too, with the two new variable power plants that can do some scheduled load following; and it can certainly be anthracite coal. But the trick is elsewhere: even baseload prices are low because there is too much power on the market; but they single out renewables for this, instead of new coal. The fact is that wind power generates many well-paying, desirable jobs in rural places with not much else going for them. New energy sources also allow these states to diversify their economies. This alliance of green and red politics helps keep the industry going at a time of low wholesale electricity prices--the result partly of cheap shale gas, and partly of a drop in demand because of the sluggish recovery. All would not be lost if the PTC disappeared. Without it, there will still be a trickle of demand for new turbines. Concerns about the intermittent supply of energy from wind are dying down. It turns out that with enough wind farms sited in enough places, the supply evens out. The wind is always blowing somewhere. And a solid majority of Americans continue to favour alternative, clean power sources over traditional fossil fuels. Private insurers say that last year was the second-most-expensive in American history for disasters related to climate change, costing them $139 billion. But private insurance paid only a quarter of these costs, leaving taxpayers to cover the rest. By comparison, funding renewable energy properly seems rather cheap. Apparently "The Economist" is many people, and they don't all talk to each other. About the intermittency concern, perhaps what has happened is, that in a number of places wind penetration is well over 20% now, and contrary to the scare stories the lights didn't go out... however, their story is still wrong: yes, the wind blows (almost) always somewhere, like the sun is shining almost always somewhere; but still you need back-up. Even for penetrations of 100%-plus. But perhaps Jake is right and The E isn't into due diligence much. A positive surprise though is that they really make the renewables-climate link explicitly, even if based on an iffy example (but then, money is what they understand). That counts as a victory for the good guys. So today is Global Wind Day! Wow, you were at Tvind? i visited that mill, and also climbed most of the ones in the history. Eric Grove-Nielsen was a friend from those days, and even today. Brings back serious pioneer memories. So, more stories from you, no? If I would tell one more story, it would be that I lived and worked for four years in Denmark, in Copenhagen, often going to the Geophysical Institute of the University at Haraldsgade 6. Those were the days of the first Greenland ice corings, the cores being brought in in crates of straw, to be stored in the cellar. The Copenhagians were strong on isotope studies. Also then (early nineties) the airborne Greenland gravity project was done, measuring gravity (and magnetism, and the depth of the bedrock using ice penetrating radar) over all of Greenland in a collaboration between the Danish Survey and Cadastre (where I worked) and the US Naval Research Lab. I would have had an opportunity to visit Summit, Greenland in those days... sometimes I still feel sorry I didn't. But then, I visited Iceland a few times. Possibly a new record in percentages? ...on last Sunday, 16 June 2013, for the first time the wind and solar power plants in Germany accounted for a record amount of more than 60 percent of the necessary national power supply capacity. The previous peak value, 59.1 percent, was registered a day before, on Saturday, 15 June 2013. An article on a German-language energy blog highlights the unsung component of Germany's supposed grid crisis: excess production from traditional plants. During this day, fossil-fuelled power plants contributed 17 GW at the time of the peak load (that is not all mid-merit plants were throttled), against some 6.3 GW of exports. Great article DoDo... and 144 tons saved in one day! I now think the author made a mistake, though: I believe 17 GW should be all conventional plants (including nuclear). Upon checking, Grafenrheinfeld and Philippsburg 2 were off-line that day, leaving 9,391 MW of net power (9,883 MW gross) if operated full-throttle. Eh, the author made a much bigger mistake: if you do the sums you'll see that the correct answer is 1000x larger, more like 144 000 tons! An interesting analysis of turbines for lower wind speed regions. These are optimized for lower windspeeds with larger ratio of swept area to generator size. These installations have a larger capacity factor. Jerome, I one asked what you thought of turbines in built-up areas. Does this new development change anything? New developments on HVDC too. Nice essay at IEEE's Spectrum. And the recent adoption of a new power grid law means that this is really going to happen.